Please excuse the small sample size! There's not too many current players, so it's harder to get the more realistic response counts that happen in real life (~1000). The following is our first examination of the data we received from our test survey, GSS-9, 3. This first journal examines the relationship between guilds and occupations, which can assist in identifying the strengths and weaknesses of each. Below is the crosstabulation we developed to study this. 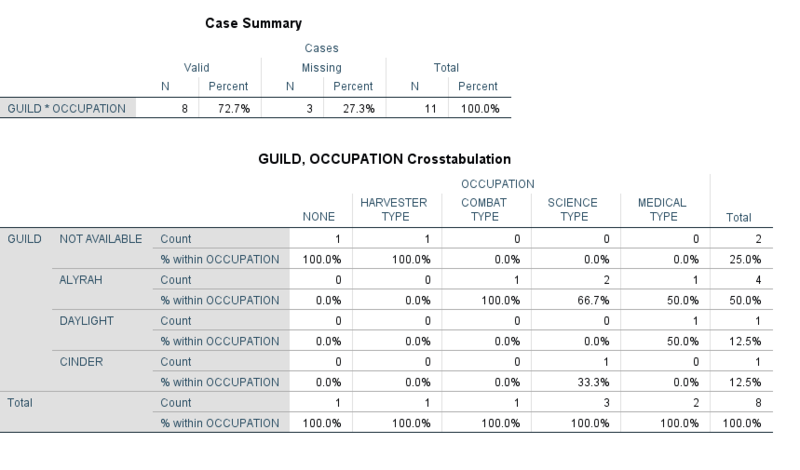 Beneath the crosstabulation is an easier to read summary of occupations. For context, the answer given for "occupation" was asking for one's primary occupation. We understand people may hold two roles, yet one will typically be a more defining feature of the individual than the other. "Frequency" is referring to the number of responses. "Percent" is referring to the percentage given to that response compared to the total responses. 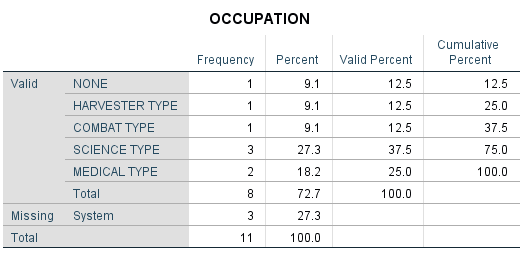 "Valid Percent" is the same as the above, removing the missing responses. "Cumulative Percent" is the sum of the "Valid Percents". The response that contains a cumulative percent of 50% also contains the median. Harvester-Types is not specific to a farm or pasture, including any sort of gatherer. Combat-Types is not specific to military or defense, and even includes militias. Science-Types is not specific to any particular science, so long as it is research of a sort. Medical-Types is not specific to any particular form of medicine or healing. The rest should not require an explanation. We do not believe this is a fully accurate representation of the current population, due to our inability to reach certain locations for responses. This is not to take away from its utility - it will be beneficial to read and study this information, however it is not yet perfect. Due to the imperfection, we will not give our views of the information solely to avoid the appearance of bias. Do with this information as you will. Our traveling issue has been solved and we will quickly return to work. We will also be releasing a new survey to cover more grounds so that Templehelm can better understand itself.